"A team of neuroengineers at Brown University has developed a fully implantable and rechargeable wireless brain sensor capable of relaying real-time broadband signals from up to 100 neurons in freely moving subjects. 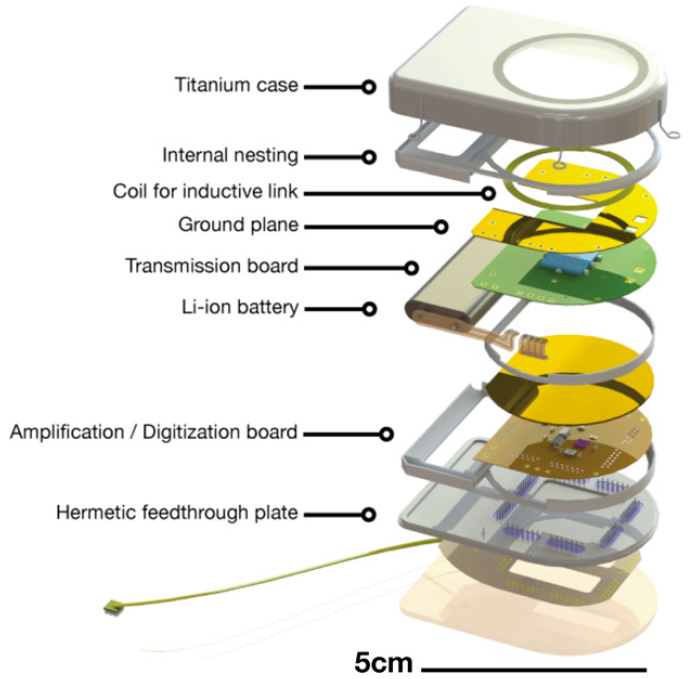 "Several copies of the novel low-power device, described in the open-access Journal of Neural Engineering, have been performing well in animal models for more than year, a first in the brain-computer interface field. "Brain-computer interfaces could help people with severe paralysis control devices with their thoughts." "The new wireless device is not approved for use in humans and is not used in clinical trials of brain-computer interfaces. It was designed, however, with that motivation. "The researchers are continuing work on advancing the device for even larger amounts of neural data transmission, reducing its size even further, and improving other aspects of the device’s safety and reliability so that it can someday be considered for clinical application in people with movement disabilities."